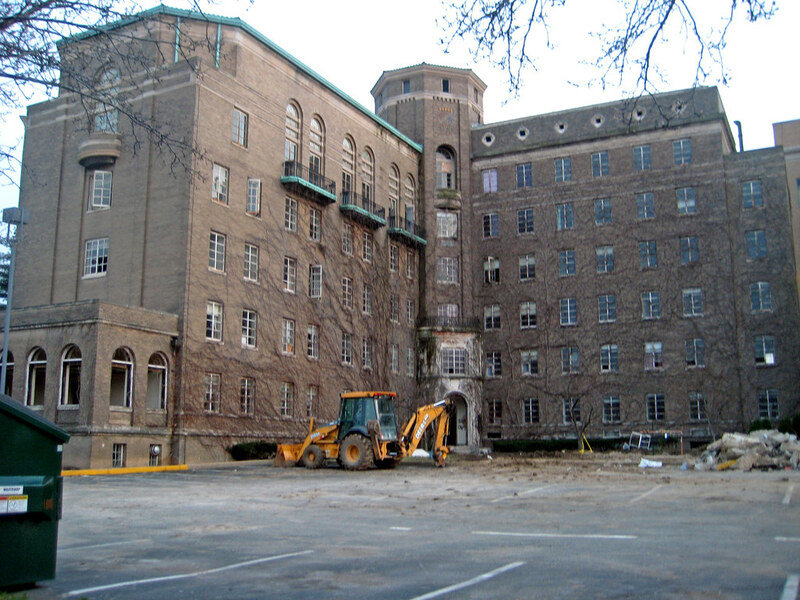 Update: Mother Concordia Hall to be replaced by "streetscape"
Mother Concordia Hall was built in 1929 on the grounds of St. Mary's Hospital in Richmond Heights to house a unit of the then newly formed St. Louis University School of Nursing. 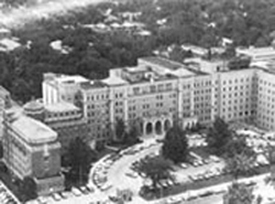 According to St. Louis University's website, the building also served as a residence hall for nurses until the early 1960's. It also served as office space for the hospital as well as living quarters for some of the Franciscan Sisters of Mary. A wood fence appeared around the building several weeks ago with signage indicating impending demolition. 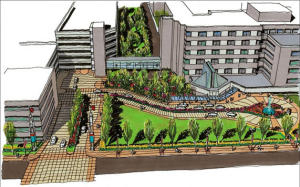 The L shaped building constructed only six years after the original hospital formed the east end of a formal architectural composition in which wings of the hospital reached out toward Clayton Road. 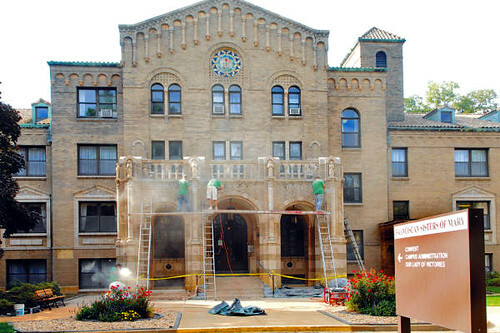 An early addition to the original building, partially visible in this photo from SLU's website, formed the west compliment to Mother Concordia Hall. This formal composition has been compromised over the years by a series of additions to the front of the original building and surrounding the west wing. 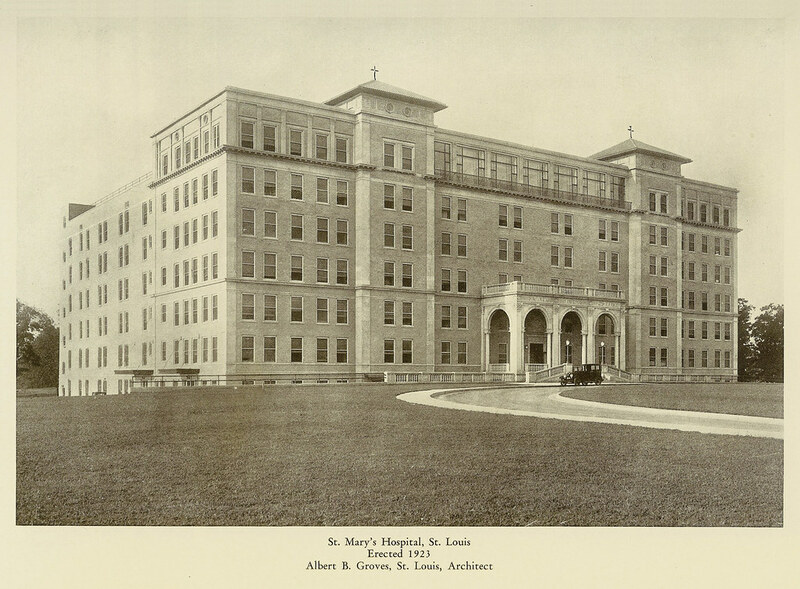 The original St. Mary's Hospital building constructed in 1923. This early photo is from Missouri's Contribution to Architecture published in 1928, one year prior to construction of Mother Concordia Hall, by the St. Louis Architectural Club. 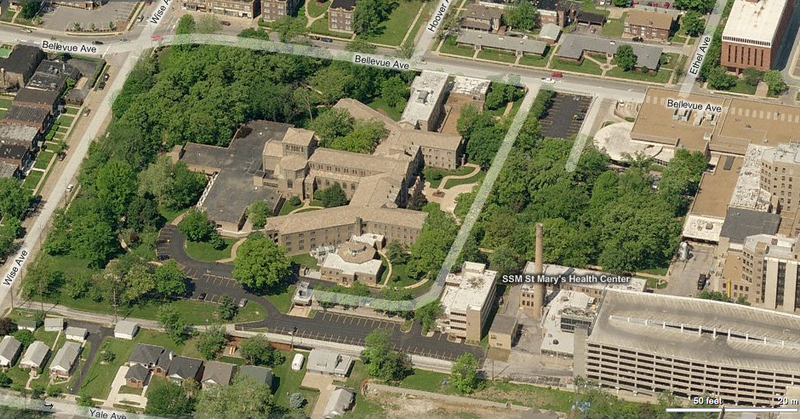 This aerial photo shows the relation of Mother Concordia Hall (just northwest of the large parking garage) to the rest of the hospital. One of the pyramid shaped roofs of the original hospital building is still visible behind a layer of building additions facing Clayton Road. 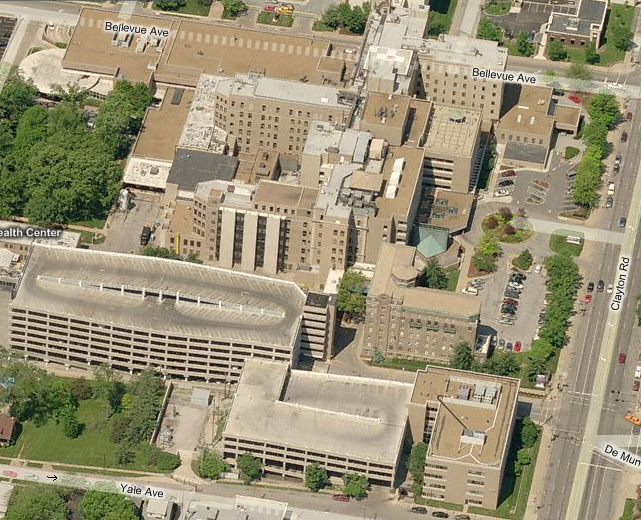 A comment on Urban St. Louis speculates that the building is being demolished to make way for a future addition to the hospital, but that construction of the new structure may be delayed due to the economy. The hospital is undergoing other renovations currently including conversion of all of the double rooms to single occupancy. Windows have been removed from a sun porch like room fronting Clayton Road. The St. Mary's hospital website is advertising a reunion and mass to be held on April 10th in commemoration of the building. Demolition will likely commence shortly thereafter. 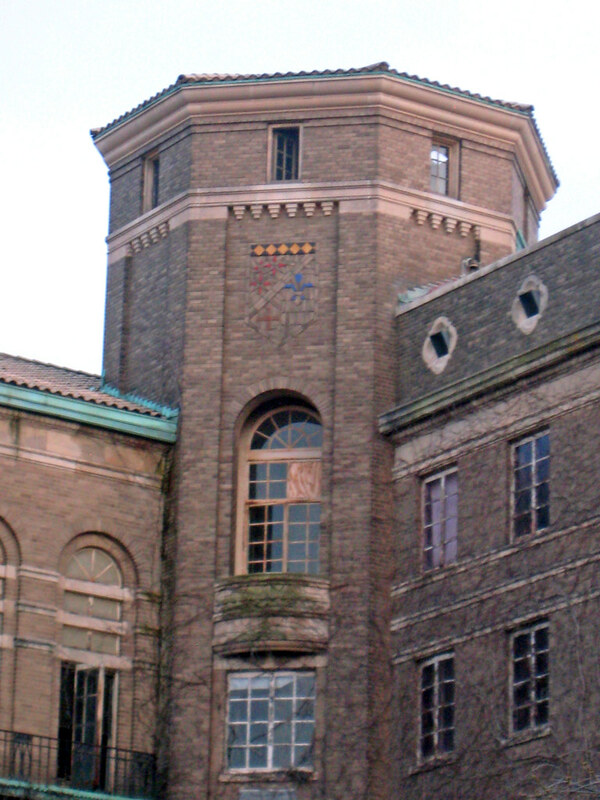 The octagonal tower features the crest of the School of Nursing crafted in colored brick. I suspect that the double-hight space at the top of the north wing contained a chapel. 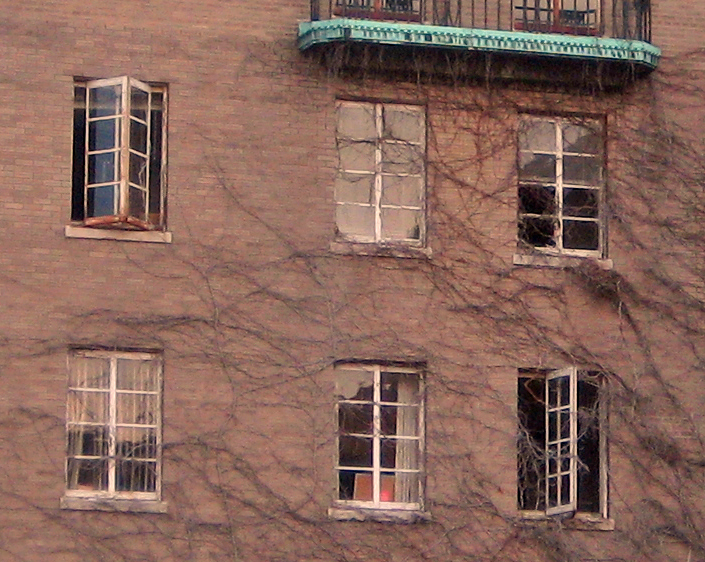 The building has somewhat unusual steel sash windows that hinge at the center and fold to the center when opened. 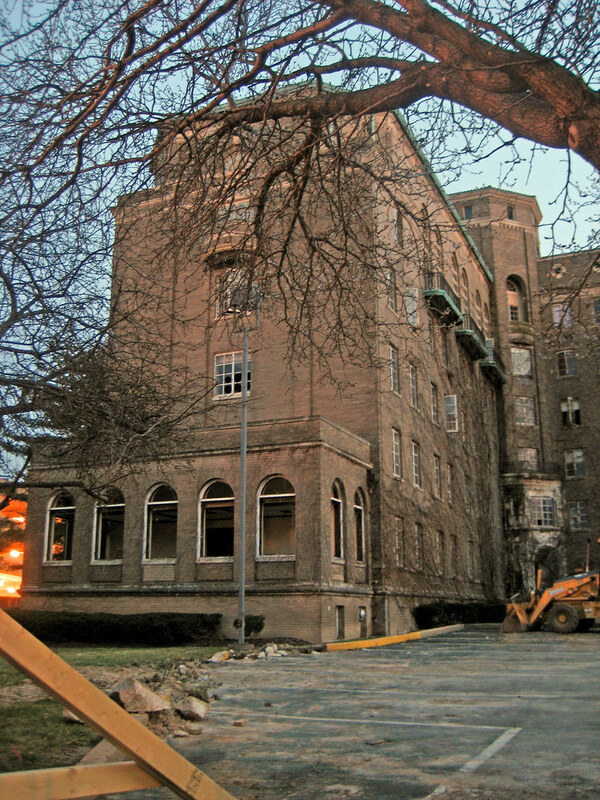 In a related story, the St. Louis Business Journal reported last fall that the Franciscan Sisters of St. Mary will be vacating its St. Mary of Angels Convent south of the hospital (photo above from the St. Louis Business Journal). Starting in May, the sisters will begin transitioning to a retirement community in Bridgeton. the story indicates that the transition will be a long process occurring as space in the Bridgeton facility becomes available. 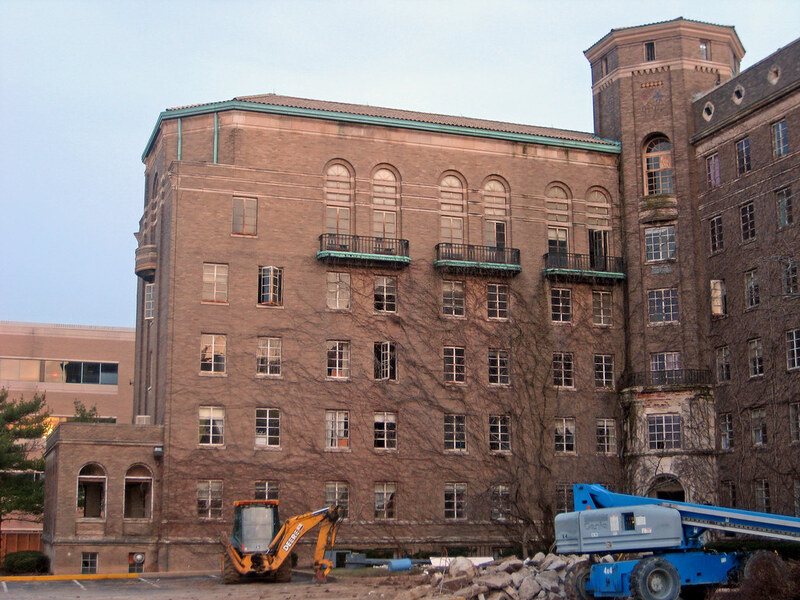 There is no indication yet as to what will become if the historic convent building that dates from 1929. The Franciscan Sisters are talking with "an number of different people" including St. Mary's Hospital about possible uses for the building and its nine acres of grounds. 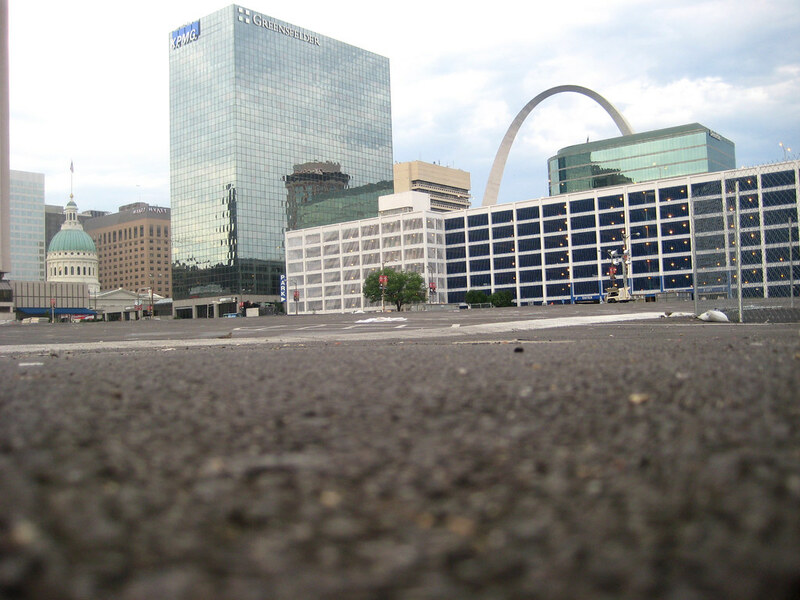 We started Saturday's City to River walking tour at Busch Stadium at the Stan Musual statue across from the MetroLink Station to emphasize the lack of a direct connection between two of Downtown St. Louis' top attractions, the Arch and Busch Stadium. Before we were able to make this point though, we walked past the six block reminder of broken promises by the St. Louis Cardinals organization to develop Ballpark Village north of the stadium. 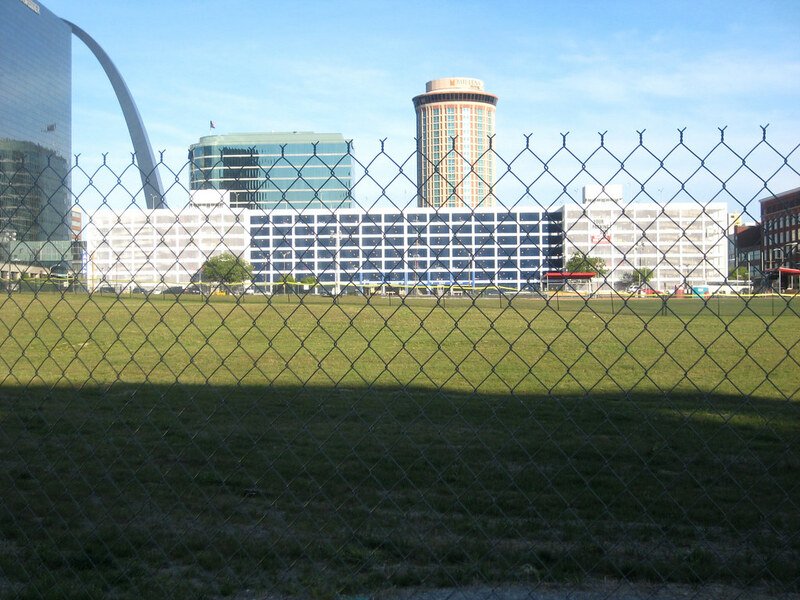 Four and a half years after the demolition of the old Busch Stadium, Ballpark village today remains a large asphalt surface parking lot, a softball field, complete with cross slope and a small lake all surrounded by a beautiful chain link fence. Across the state however in Kansas City, Cordish, the developer who was to build Ballpark Village completed last year the Power & Light District, which bears striking similarities what Ballpark Village would have been, including tenant mix. Yesterday an article in the Post Dispatch about incentives used to keep large office tenants Downtown was a stinging reminder of the loss of the Centene Headquarters, to Clayton, the nearly completed development which I covered in my last post. One thing seems certain and that is when the economy does finally recover, the likelihood of a developer coming in and developer coming in and building a six block development at once is slim. The street grid should be returned and the project should be broken up into the separate blocks that once occupied the area. 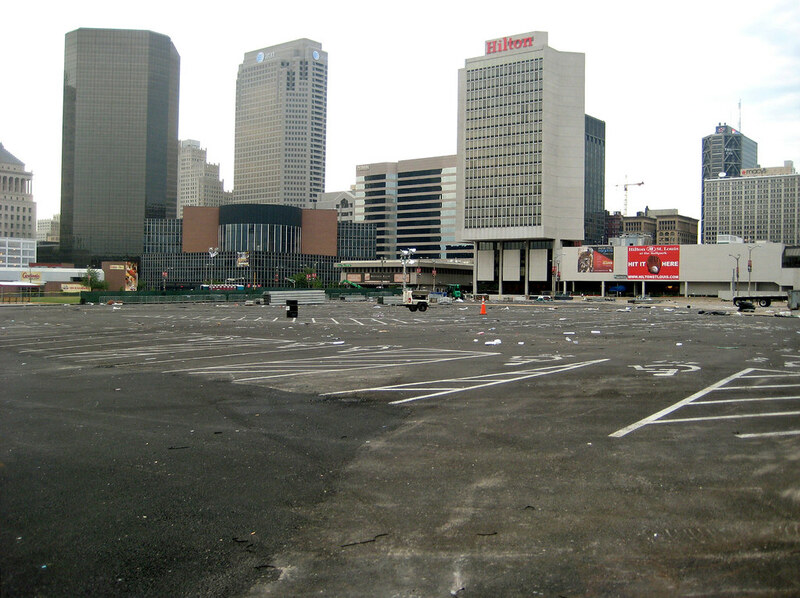 I have to wonder, if this had occurred from the beginning right after the demolition of Busch, would Centene have been able to come in and simply acquire the two blocks they wanted and built their buildings without being mired down in a complex series of negotiations between a "master developer" and the City, or would we still be stuck with the same field of broken promises? It had been quite some time, well over a year, since I had walked around downtown Clayton, so when I was finished handing out Prop A literature at the Clayton MetroLink station yesterday around 5:00, I decided to join Steve Patterson and Jason Stokes for a jaunt over to check out the new Centene Center, which recently received the last of its glass skin. The last time I had visited there on the way for a Fatted Calf burger (they recently re-opened after a fire last fall) there was a giant hole in the ground. You may recall that the southwest corner site at Hanley and Forsyth was formerly home to Harris Armstrong's Sgruggs Vandervoort Barney department store building, which had a long list of retail tenants following the closure of SVB including Dolgin's, Best, and finally the much missed Library Limited Bookstore. Don't get me wrong, I love Left Bank, Subterranean, the recently opened Archive on Cherokee, but there was nothing like Library Limited, which will never be matched by the likes of Barnes & Noble or Borders. 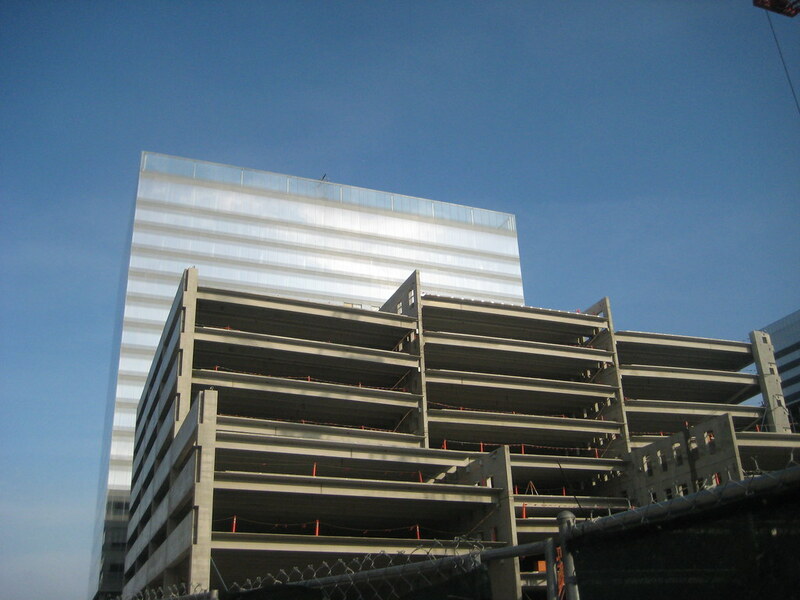 West of the glass tower is a huge and very ugly parking garage. It will be interesting to see if the concrete is clad with another material, but somehow I doubt that will happen. I always find it odd when people spend a lot of effort on the design of a project building like the Centene tower, only to have a monstrosity like this as part of the same project. 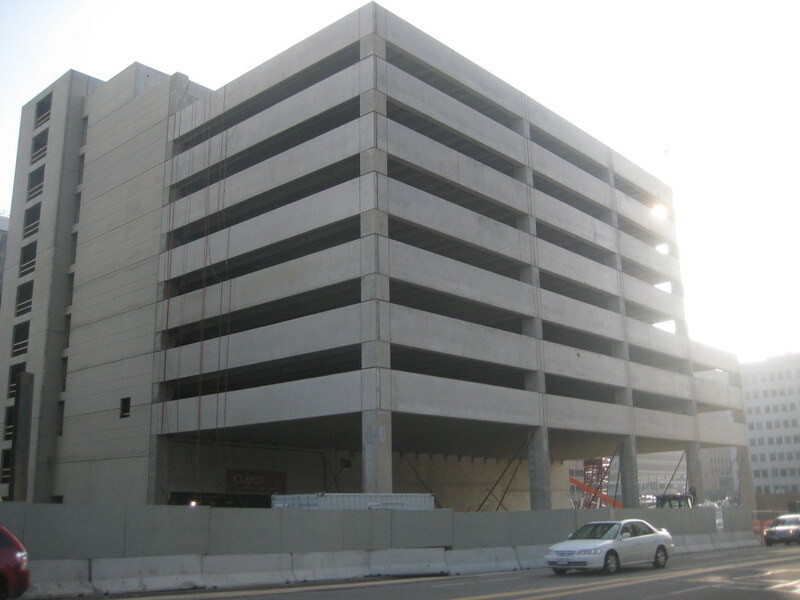 One redeeming factor is that both the tower and garage will have ground floor commercial space which the City of Clayton righty did not back down on requiring. The building is going for LEED certification. 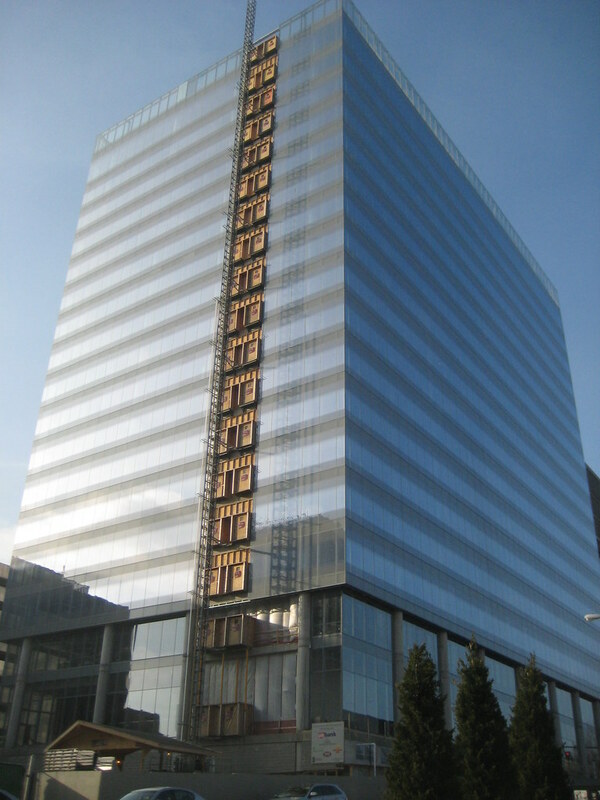 Hmmm, it is all glass with in-operable windows and a giant parking garage next door. Not sure how green that is? One thing is for sure, it reflects sunlight like a mirror, almost blinding you as you walk down the street. For more commentary on Centene, check out this post last week on Urban Review STL, and for more photos, including pics of the former Library LTD building, my set on Flickr. 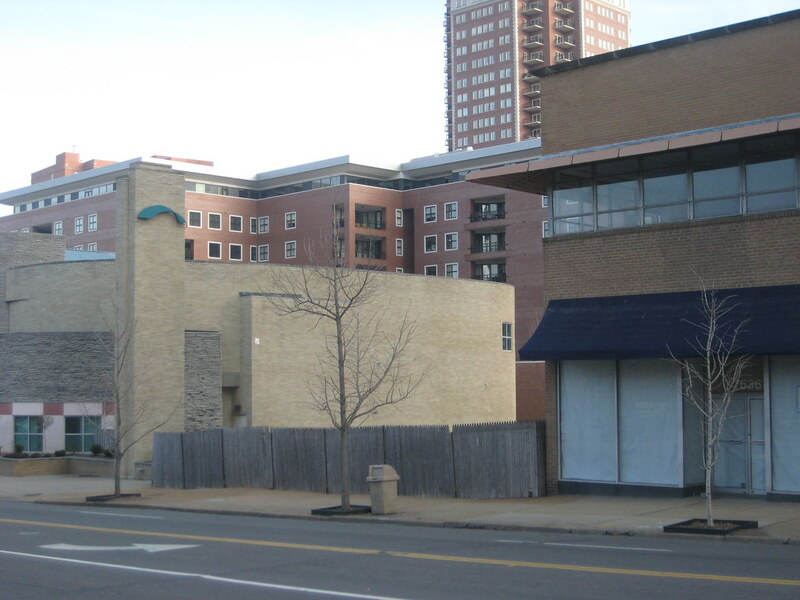 Just east of the Centene building, just east of Hanley is the site of the former Shady Oak Theater, which was demolished in November 2008 to make way for a parking lot for the building on the corner. A year and a half later, the "temporary" wood fence that was put up for demolition still fronts the site. I guess the really needed that parking! After our trek from the Clayton MetroLink station to the Forsyth station, I came to this conclusion: Clayton may be our regions "second downtown", and it does have many "urban" qualities including a grid of streets, alleys, a few nice streets of quaint shops, many restaurants (including the best burger in the region) but it is still largely the same boring home to so many faceless mirrored glass boxes that I remember well as a child... with one more glass box opening later this year. Pinnacle Casino's announced this week that it is giving up its fight with the Missouri Gaming Commission to retain its casino license for the President Casino which is housed in the historic Admiral riverboat. The casino will close July 1st. The Admiral was scheduled for a hull inspection in July, which it is expected to fail. 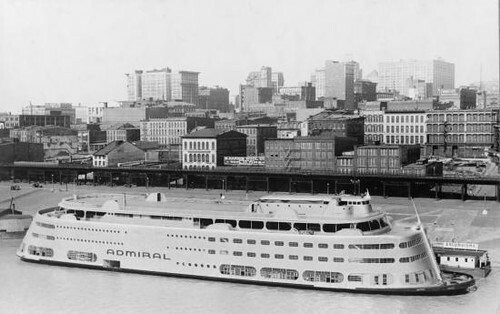 Pinnacle had previously committed to keeping the President open even if it meant repairing the Admiral and possibly moving it to another location. Now the boats future is uncertain. Some comments from my post on Washington Avenue made me think I had not clearly expressed some of my thoughts. Maybe the post comes off more negatively than I had intended, but I do not think that all that has happened to Wash Ave is bad. I am glad that buildings that had suffered major deferred maintenance were renovated. I am glad that there is a streetscape with trees. I'm glad that there are newer restaurants and some new retail. I am glad that there are new residents. The things that do bother me about the transformation are that affordability is almost completely gone. 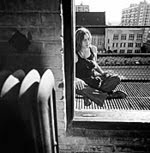 I find it depressing that most of my friends and myself who are for the most part in their 30s and relatively successful could not afford a new condo in the loft district, unless it is a very small one bedroom unit. We choose then to live in the City's neighborhoods where you can still get a 2,000 s.f. house for the same price as a 900 s.f. loft downtown. I would bet that even more people would move Downtown if prices were more comparable to a house. It bothers me that there is so much vacant first floor retail space that is over-priced so that a small business could not afford to open. One of my friends has thought about opening a new shop there, but might end up on Cherokee because of the high rent along Washington. I'm sure prices have come down some since the market crash, but there are still so many over-priced residential units in the area (that now have to be rented out) that it will take years for the market to absorb them, if ever. Meanwhile, artists and other creative people who would want to live in the district or maybe open a business there are priced out completely (except for the few affordable artist units that have existed in Art Loft and University Lofts since before the condo craze) For businesses, Crepes in the City is a good example of one that could not make it due to their high rent cost even though they were packed on weekends. I was sad to see them go. One commenter mentioned that the people in the loft district in the 1990's were not investing in the area. I would argue just the opposite. Why should an artist that puts everything they have into a loft, even if that is not much, or a creative business that invests in equipment, furnishings and employees, but has cheap rent not be considered an investment. 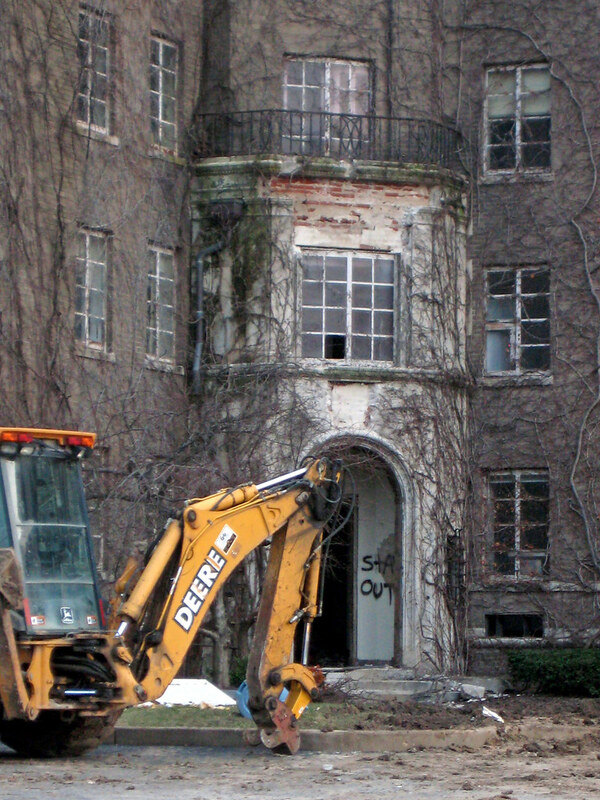 Sure they were not spending $100+ a square foot to renovate a building, but they were still investing what they could in an area that industry had abandoned. Yes, many buildings did need severe overhauls, but many really did not. 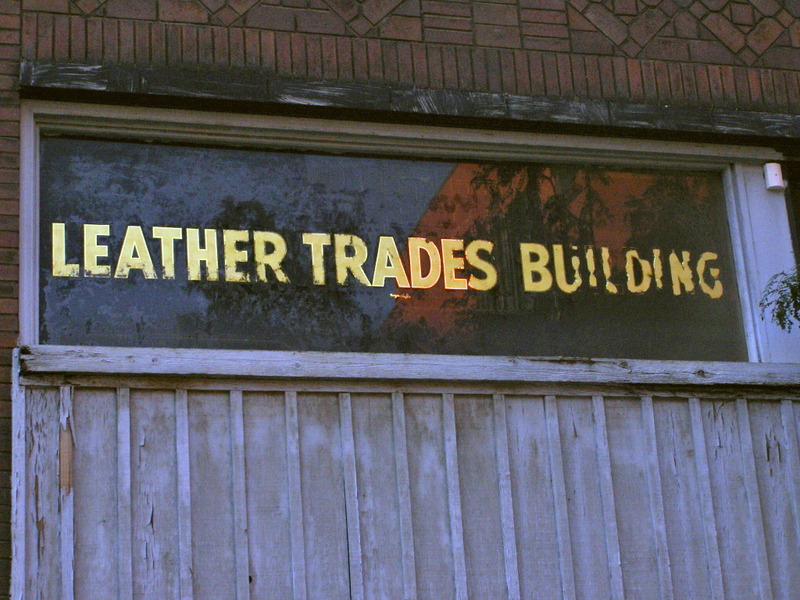 The Leather Trades Building on Locust is an interesting subject. When Pyramid bought it in 2006 it was full of artists, at least one architect, and a few other businesses. The elevators were operated manually, but they worked. Sure, the building had deferred maintenance, but it functioned. 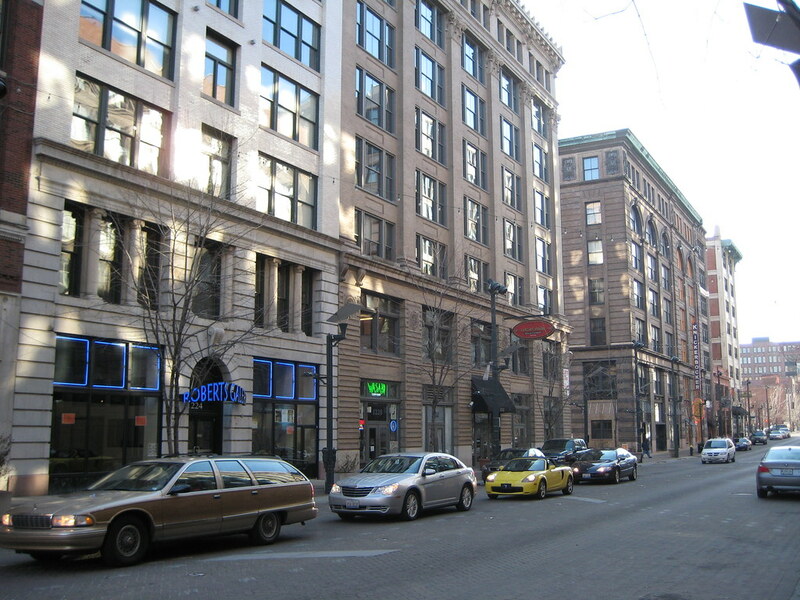 Pyramid emptied the building and proceeded to turn it into "luxury loft condominiums" (see article from the RFT). This failed miserably even before the market crashed, with only a few units reserved. Almost two years after the disappearance of Pyramid, a new developer is poised to finish the now gutted and empty Leather Trades. Ironically, Dominium Development of Minneapolis will do what I had suggested to Pyramid's Development staff and convert the building back into affordable artist lofts. They will not be as large as some of the former spaces, and will likely be more expensive, but given the waiting lists at the district's existing artist buildings, the demand seems to be there. I look forward to return of artists to the building. 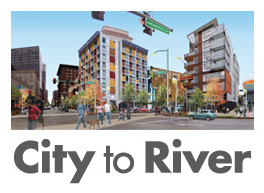 This Thursday evening City Affair will take on the topic of gentrification in St. Louis. 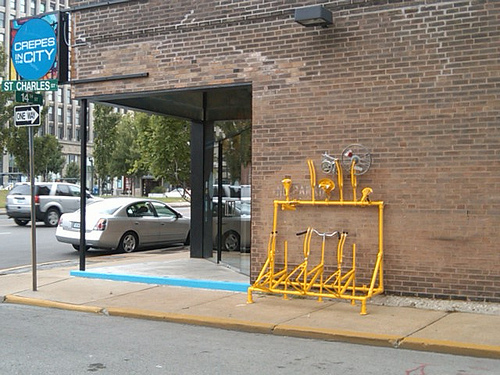 The event will be held 7:30 PM at Style House, the new retail outlet & headquarters of StL Style, located at 3155 Cherokee. The topic got me thinking about the changes that have occurred over the past decade in Downtowns loft district. 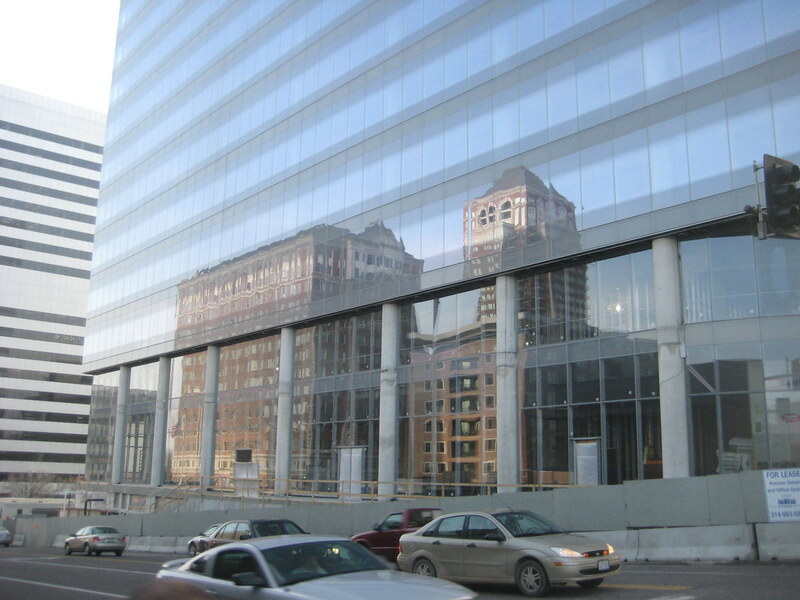 The redevelopment of the Washington Avenue is widely acclaimed as one of the big success stories of Downtown St. Louis. The story that is usually not told however is how is how when the grit disappeared, so did many businesses and the affordability of the district. 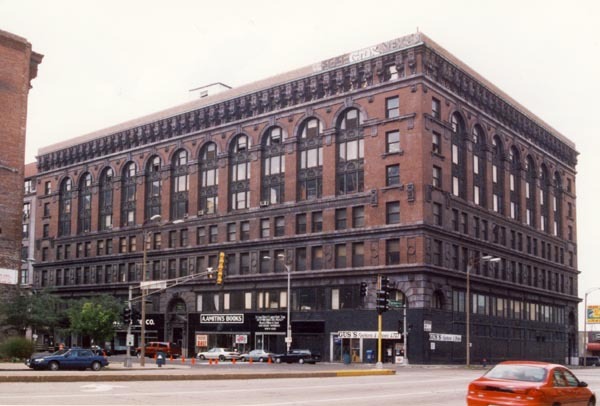 In the early 90's, long before speculators moved in and jacked up building prices, a developer offered wide open lofts for sale in the Rudman Building at 13th at Washington for $90,000. Each loft was a quarter floor with over 2,500 square feet of space. These were not going to be the "luxury" lofts that you see advertised today, but the real raw thing. Unfortunately they did not move forward. 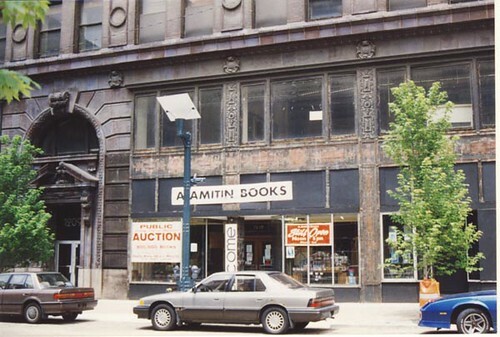 While the upper floors of the Lesser-Goldman Building were still used for warehousing, the first floor had several long time retailers including Gus's Fashions and the amazing A Amitin Book store, which was jam packed with more used books than one could imagine. 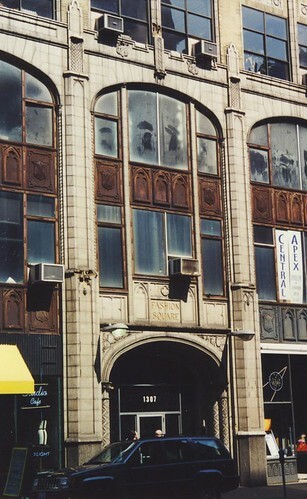 Nearby was Cummels Cafe, which started in the Leather Trades Building on Locust, and offered a different delicious home cooked menu each day. Next door Cummels was a small shoe shine and repair shop that extended the life of many pairs of shoes for a very reasonable cost. 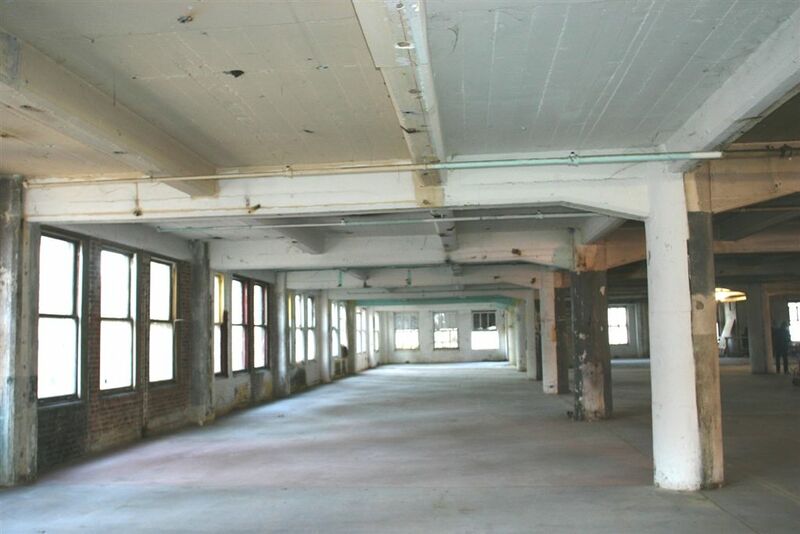 After the building had been through the hands of Dave Jump, it was sold to Jacob Development, who attempted to develop the building into the Bogen loft condominiums. In the change of hands, all of the ground floor tenants were thrown out. 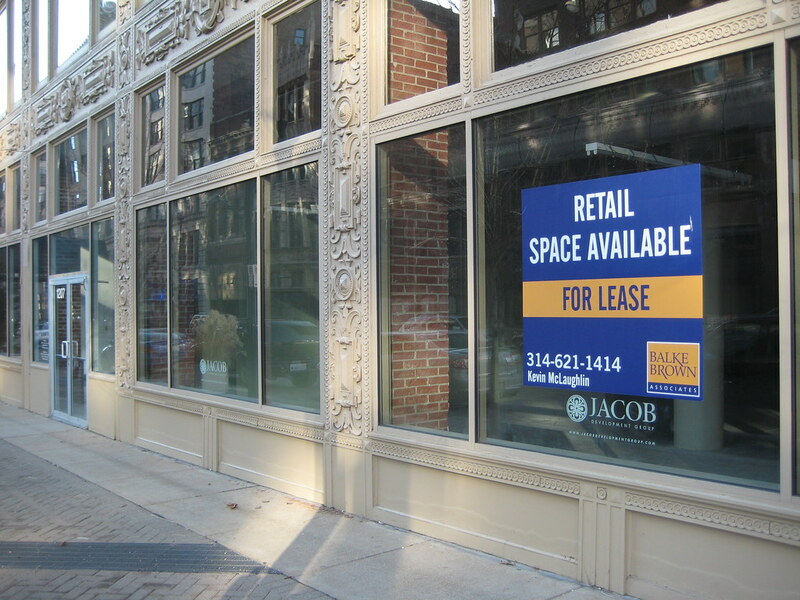 Today the entire ground floor is composed of a now defunct sales center (the many unsold units are being leased as apartments), a few fake storefronts with a few items sitting in the windows and mostly wide open vacant retail space. 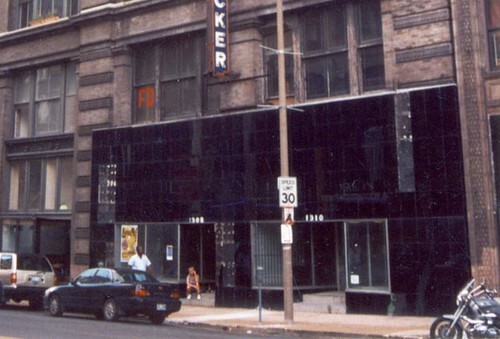 The prime corner at Tucker and Washington has never been occupied since Gus's was given the boot. Then there was 1227 (and its successors), one of the many night clubs that brought more life to Washington Avenue at night than there has ever been since their calculated disappearance from the district. 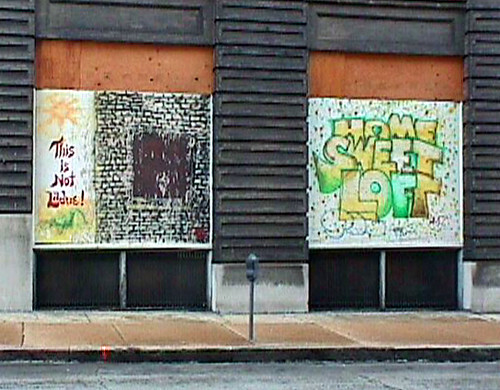 Before its redevelopment, the Fashion Square building offered very affordable loft space that was mostly occupied by creative companies and a few artists. Our first office of Pyramid Architects was located here on the 6th floor from 1999 through 2002 (when we took free space in the recently acquired Paul Brown). We had a spacious 2,500 square foot loft for $600 per month! On the ground floor was the tasty Studio Cafe and Velvet. Down the block were several longtime businesses including Marti's Shoes and some remnants of the garment days including a few wholesale fabric shops. 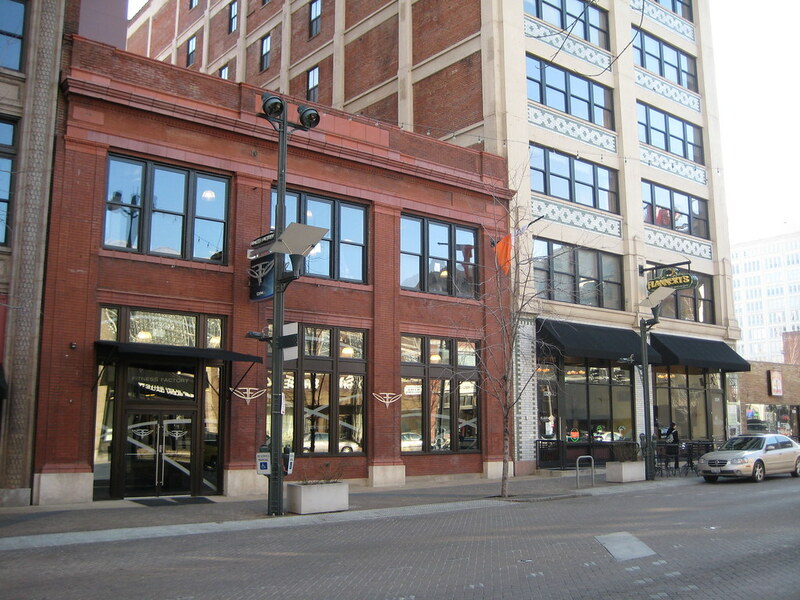 When Fashion Square was redeveloped by the McGowan's in 2004, all the creative companies were replaced by standard loft apartments. Another architect on the 7th floor moved to the A. D. Brown Building at Tucker and Washington where he was then kicked out again not too long after the move when that building was redeveloped. 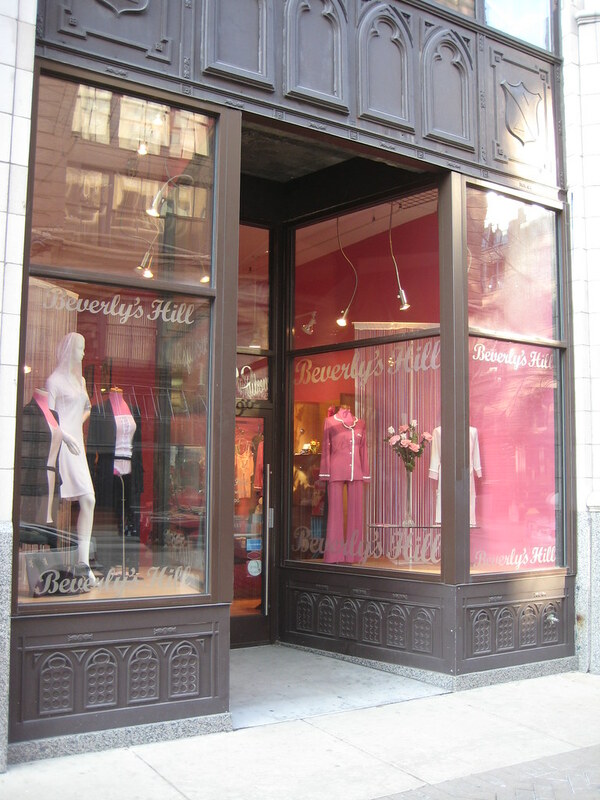 The ground floor of the building has unlike the Bogen, been pretty well leased to newer more upscale retailers. 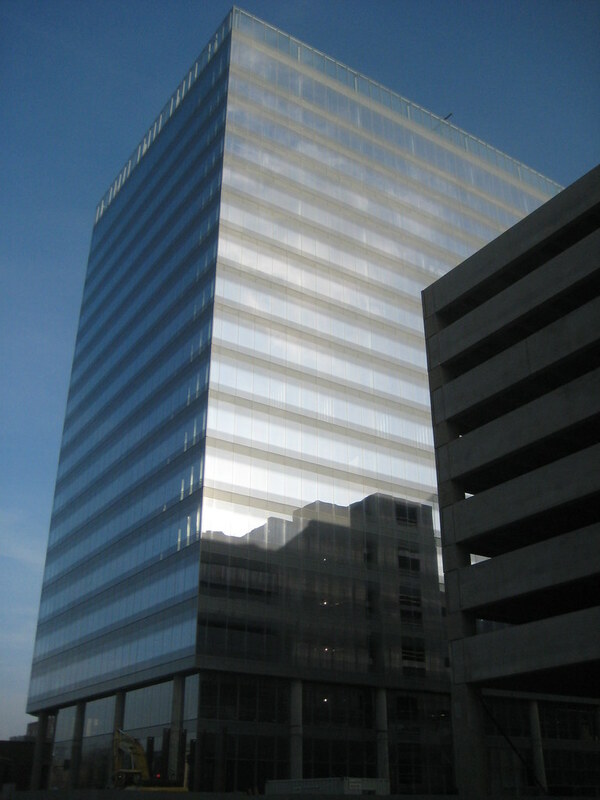 In full disclosure, I worked for Pyramid Companies for nine years during the height of the transformation of Washington Avenue. During that time I witnessed and took part in these transformations with very mixed emotions. I thoroughly enjoyed working with the buildings and tried where possible to retain some of the character that the buildings had acquired over time (see the Dorsa Building, whose green facade some wanted to destroy). It was great to see new residents move into the area but at the same time very disheartening to see the existing residents and businesses leave, which was almost universally the case. The experience leaves me asking the question: Is it possible to redevelop or improve a district like Washington Avenue without what some have called the Disneyfication effect taking over? Is it possible to retain existing businesses, residents along with some of the character and gritiness of pre-development days and still attract an economically diverse new group of residents and businesses? Hopefully we will find out on Cherokee Street.